In October 2011 Russian CAD software outsourcing powerhouse Ledas sold its intellectual property to Bricsys. This IP included LGS 2D, LGS 3D, Driving Dimensions and RhinoWorks among other CAD tools and technologies. To manage this IP and take it further Bricsys created a new company in Russia called Bricsys Technologies Russia and hired the then Ledas CEO Dmitry Ushakov to be its CEO. Bricsys signed a service agreement with Ledas whereby Bricsys would hire some of Ledas’ developers to work under Dmitry. This alliance has been a win-win for both parties. Bricsys was able to add Variational Direct Modeling to BricsCAD, thereby making an entrance into the MCAD space. 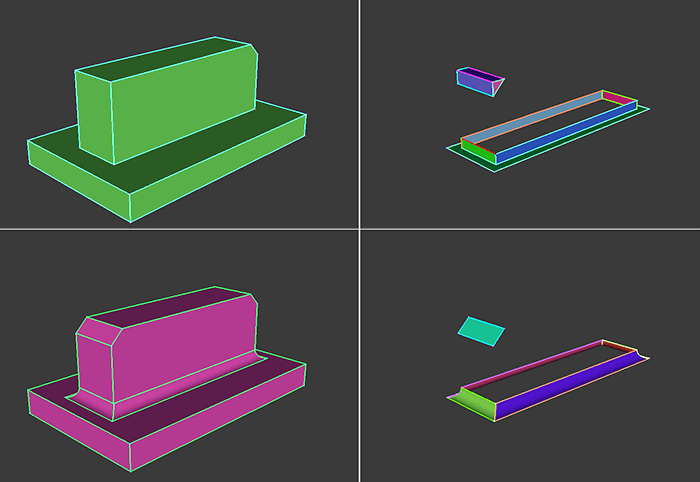 To know more you may want to read my “Direct Modeling in Bricscad V12” blog series. A year ago I got an interesting email from David Levin, the co-founder and Chairman of the board of Ledas. I’m on Ledas’ board of advisors and he wanted to bounce a few ideas off me as well as other people. His vision for Ledas was not just to continue providing software development services, but also to invent and create new technologies. One of these technologies was announced yesterday – 3D geometry comparison. This technology involves comparing geometry assumed to have come from the same source and detecting and displaying the differences. This will be useful in keeping track of changes made to a model during its life cycle. The image below shows a pair of 3D models on the left and how they differ from each other on the right. This technology doesn’t use boolean operations to arrive at the geometric differences. Ledas created its own geometry comparison algorithms. Ledas hopes to deliver this technology via the cloud as well as license it to interest CAD and PDM software vendors.